He has also suggested that it’s not too far-fetched to think that women may even be admitted to the priesthood in the future. Not only have these comments raised eyebrows, but so has the fact that Fr Glettler is not from the federal state of Tyrol in Western Austria where Innsbruck is the capital. Instead, he’s from the southeastern part of the country and a priest of the Diocese of Graz, as well as a member of the Emmanuel Community. “Rome decides against Tyrol,” said the headline in the Tiroler Tageszeitung (TT), the first media outlet in the country to break the news of Glettler’s appointment. The TT said the delay in filling the vacancy was due to “fierce disputes” between Pope Francis and the Congregation for Bishops. Without giving any further details, it said Rome had “once again decided against the suggestions made by the local church and the diocesan bodies”. “It will never be possible completely to clear up the mystery of who blocked whom,” wrote Dieter Neuwirth, religious correspondent for the Austrian daily Die Presse. He claimed it was a “well-known fact” that the papal nuncio in Austria, Archbishop Stephan Zurbriggen, did not get on with the prefect of the Congregation for Bishops, Cardinal Marc Ouellet. “They are anything but friends,” Neuwirth asserted. “It urgently needs rethinking,” he said without hesitation. “I don’t want to sound precocious. The bishops in the Congregation for Bishops are all very experienced. But I see an urgent need for change,” he continued. “Every bishop has the duty to name three possible successors. That is sometimes thrown overboard. Nontransparent interventions are tedious and also harmful for those concerned,” the bishop-elect said candidly. “A Tyrolese Franciscan once told me, ‘In the final instance, once can always presume that the Holy Spirit is at work behind these human decisions, but it’s best not to watch the Holy Spirit at work in such cases as this tends to make one’s head swim’,” Glettler said, quoting the friar. He said he understands people might be irritated and frustrated by an outsider being chosen for Innsbruck. “We must allow a time for mourning. And then we must ponder over why the procedure was delayed in such a peculiar way,” he said. “Perhaps because I’m unconventional enough, ham-fisted enough and astute enough for him?” he said with a smile. Glettler signaled his self-described unconventionality at a brief prayer service with the baptized faithful in Innsbruck’s cathedral before the briefing got underway. He invited those present to gather closely around him and asked them to lay their hands on him in prayer. The pope’s choice may also reflect Fr Glettler’s work with immigrants. In the year 2000, he began welcoming African Catholics in his parish in the Archdiocese of Graz. It is now home to a large and vibrant English-speaking community that celebrates Mass there every week accompanied by West African music. 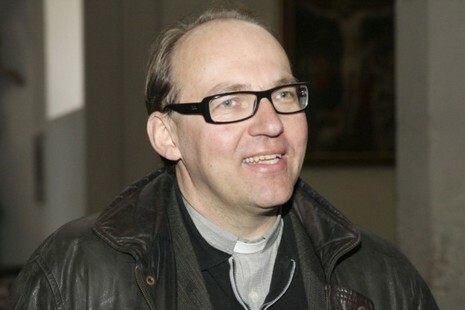 In the days since his appointment to Innsbruck, the bishop-elect has given a series of interviews to Austrian media. And he’s not shied away from responding to some the hot-button issues in the Church today. For instance, he said he “would be very glad” if the papal study commission on the female diaconate in the early Church were to arrive at “positive decision relatively soon” so that women could be ordained deacons. “That would be a wonderful and most important step,” he said, adding that it was not “utopian” to hope that women would one day even be ordained priests in the Catholic Church. “Structural changes and concrete measures to relieve priests are called for,” Glettler said. He said that included the ordination of married men of proven virtue (viri probati), although he warned against abolishing voluntary celibacy. “On the face of it, celibacy is an idiotic sacrifice, but viewed from the inside, if it is nourished by a spiritual source, it is madness for Jesus’ Christ’s sake,” the bishop-elect said. He added that he would continue to do his best to convince young people that celibacy of this sort is a “fascinating lifestyle”. On other issues, Glettler said he is “very” much in favor of allowing divorced and remarried Catholics receive the sacraments. “From the Gospel point of view it makes a great deal of sense,” he said. As far as relations with Islam are concerned, Innsbruck’s new pastor said he’s in favor of being “welcoming, but also wise”. While rejecting Salafist political Islam as “dangerous”, he said he respects the majority of Muslims. “The main thing is dialogue, dialogue, and more dialogue,” he insisted. Bishop-elect Glettler was asked which of Pope Francis’ impulses had most surprised him and which he wanted to take up. “Pope Francis is a critical conscience for the world public, a hugely unifying figure,” he began. “As a newly appointed bishop, I want to go on learning from him. The way he listens to people to see what goes on in their hearts is a tremendous gift,” he said. Fr Glettler is scheduled to be ordained to the episcopacy on December 2nd in Innsbruck’s cathedral.